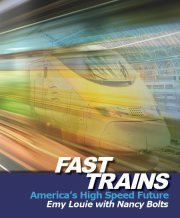 (RALEIGH, N.C.) -On September 19, a team of versatile talents will release the high-speed rail industry’s newest fully illustrated book on paper back, Fast Trains: America’s High Speed Future. The team consists of a high-speed rail spokesperson, a marketing expert, and an award-winning photographer who have worked tirelessly to create this compelling new book about the benefits of a vigorous high-speed rail system throughout the United States. The newest addition to the leadership team is Thomas Hart is Vice President of Government Affairs for the USHSR and a partner and Director of Government Relations Quarles & Brady Law Firm in Washington D.C. Thomas Hart will partner with Louie and Bolts in the promotion of Fast Trains. Hart is responsible for the general advocacy for high-speed rail policy and legislation in the United States for USHSR and has significant influence among political circles and high-speed rail aficionados. Three months after its May 21 release in e-book form this year, Fast Trains became the top ranked and one of the top 25 best-selling books in its category on Amazon.com. “The book tells intriguing narratives from the point of view of the author as well as characters,” said co-author Bolts. “It makes an emotional connection with the public and arouses the imagination of an America with modern high-speed rail moving transportation into the 21st century,” said co-author Bolts. The USHSR is a national non-profit that aims to build public, business and political support for a nationwide high-speed rail system. For more information on the USHSR, visit www.ushsr.com. For more information about the book, visit www.fasttrainsbook.com. For media inquiries or advance media credentials, contact Nancy Bolts at (919) 324-5779. This entry was posted in Vision and Leadership and tagged Bruce Johnson, Emy Louie, fast trains, Fast trains book, Fast Trains: America's High Speed Future, high speed rail book, high speed rail books, Nancy Bolts, thomas hart, US High Speed Rail Association, ushsr. Bookmark the permalink.